Alice Brennan has decided she is going to marry her boss, Innes Whitlock. Innes is rich and definitely interested in Alice and her boyfriend has just jilted her. She is honest about it. When he proposes, she even tells him she is marrying him for his money. On a car trip, they get stranded in his home town, Ogaunee, Michigan; Innes decides to visit his three half-sisters. Each sister has a serious disability. Gertrude is blind, Maud has lost her hearing, and Isobel has only one arm. And they are very, very strange. Until Innes proposed to Alice, the three sisters expect to inherit from him. So when accidents start happening while they stay at the old Whittaker home, Alice and the chauffeur think that the sisters are trying to kill Innes before he changes his will. He was bound for Pinebend, a few hours away, where there was an Oneida reservation. Duff was interested in Indians, this trip. He had been rambling through northern Wisconsin and in and out of the Upper Peninsula, collecting impressions for Duff's History of America, a most unorthodox work which would take him, he cheerfully hoped, the rest of his life to write, between murder cases. Ogaunee was a central place to stay. 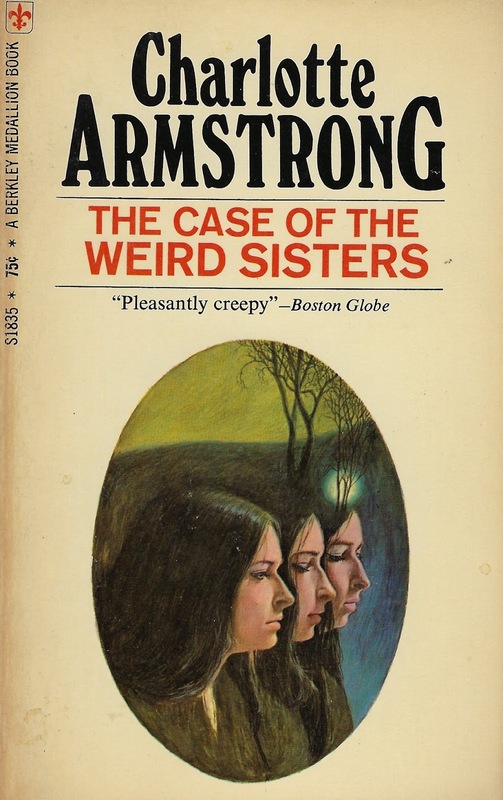 I remember Armstrong's books as being just a bit more creepy and weird than I like but this one was "pleasantly creepy" as described on the cover. I mostly agree with the quote from the Boston Globe. The story was engrossing and very hard to put down. The only drawback for me was that the mystery and the working out of the solution was much too complex. This story is a bit odd, the writing is unusual, and most of the people are odd. But I found it endearing and charming, and very much liked the writing. MacDougal Duff is the detective in three of Charlotte Armstrong's early novels. Otherwise, all of her novels were standalone mysteries. I love the paperback edition that I read, pictured here. Sadly it fell apart after I read it. But the image of the three sisters depicted on the cover is not representative of what they looked like in the book. Each was different, in looks and temperament and much older than the women on the cover appear. 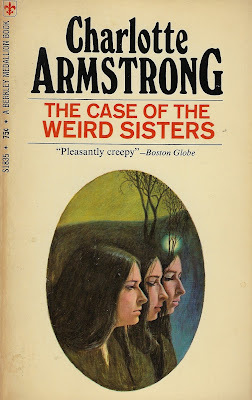 There was a film based on the book, titled The Three Weird Sisters. I haven't seen it and don't know much about, but the location was moved to Wales and the story changed a bit. I read this book in early October, immediately after reading this post at Clothes in Books (by guest blogger Colm). Two other good reviews of this book are at Beneath the Stains of Time and At the Scene of the Crime. I read another book by Armstrong, The Unsuspected, in November 2018, and I enjoyed it even more. It was made into a movie with Claude Rains, which was also very good. I will be reviewing that book soonish. I am sorry I waited so long to start reading Charlotte Armstrong's novels again. Publisher: Berkley Medallion Books, 1970. Orig. pub. 1943. Probably not a book or author I'll seek out. Too much already. I'm glad you enjoyed it for the most part. Yes, Col, we are in the same place with way too many books. And this is probably not a good author for you anyway. I read some Charlotte Armstrong books way back when, Kay, and I don't remember much about them or which ones. I liked the writing, but they made me feel tense. I have 2 or 3 more to try. In the review, you wrote: "An old professor of Annette's, Macdougal Duff"
Wow, I don't know where I got the name Annette, so strange. I fixed the sentence, which I did not like anyway. Thanks for pointing that out, Keishon. I did enjoy this story, even though it is not thought to be one of her best. The film is chiefly notable for the fact that Dylan Thomas was one of the adapters/scriptwriters. As you say, the plot - and characterisation and motivation - is very different to Armstrong's version. I would not mind seeing the film if I had the opportunity. From what I read it seemed that a lot was changed, although of course not the three sisters. I had - may still have in a box - a collection of four or five of her books, and read the first in it. I was unimpressed, but later read the second. That was enough for me, thanks. Sorry I don't have the titles of those I read, but it's been a while and the book is not at hand. Suffice to say Armstrong is not a favorite. Rick, I remember having some problems with her books when I read them years ago, but so far I have enjoyed the two I have read. And they are fast reads. Hmmm...I've read a little Armstrong, Tracy, but not this one. It does sound interesting, though, if a little different. This is an earlier book of Armstrong's, Margot. As was The Unsuspected. I will have to try some of her later books and see how they changed. I want to go right out and get this one! And The Unsuspected! Maybe I have one of hers somewhere on my shelves, I’ll go look. The Unsuspected was my favorite so far, Peggy, but if you can find either, they will be worth a try. I read Colm's copy of this Tracy, after he blogged on it, and I enjoyed it too. I was glad to read his post, Moira, because I needed a nudge to read her books. And luckily this was one I had acquired. Jerry, I will be looking around for more of Armstrong's books. Right now I have a few of her books up to 1950, and then 2 or 3 of the later books. I haven't read anything by Armstrong, altho somehow I know the name. Your intriguing review has me straining at the bit to see if Amazon has a Kindle version. I love the premise of promise of this one! I don't know about this particular book, Mathew, but Mysterious Press has many e-books by Armstrong. I might even read some of them that way because they are usually short books. I downloaded the first in the series--Lay On MacDuff. I usually like to start a series at the beginning! I prefer to start a series at the beginning also, Mathew, but in this case I did not realize it was part of a series until I finished it. Not that it seems to make much difference with older mysteries. I just discovered I do have the third book in the series, but it is buried in a box somewhere so I will have to go searching for it... and then read it.